At left: Our T20 Grand Final team. L-R: Back - Michael Ozbun, Nate Wolland, Ben Thomas, Luke Brock, Chanaka Silva, Stephen Esmore, Anthony Cafari and Charles Bibby. Front - Nigel Cowan, Lou Raffaele, Daniel Comande and Jack Newman. 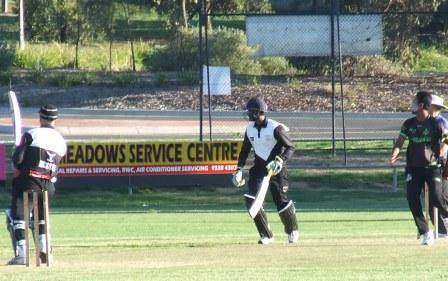 The Moonee Valley emblem was in the limelight when police took to the field in an annual cricket match to honor the memory of Luke Batty. The death of young cricketer Luke, 11, in 2014 led Victoria Police to further strengthen their response to family violence. 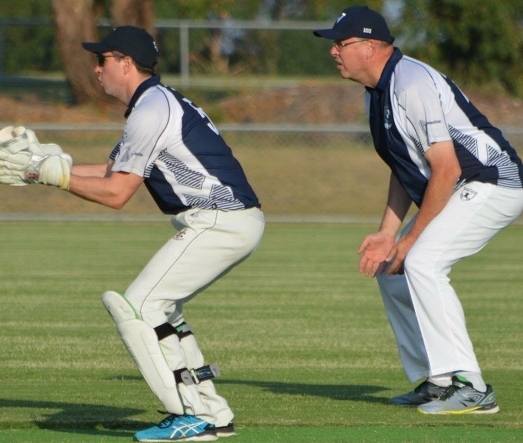 The Victoria Police team for the January 25 Twenty20 match included Chief Commissioner of Police Graham Ashton and his chief of staff, Brett Curran – both prominent in Moonee Valley Cricket Club pants with our logo on the left hip. At right: The Moonee Valley Cricket Club emblem is clearly visible on the left hip of Chief Commissioner of Police Graham Ashton, fielding at slip. Brett is well known to Moonee Valley supporters as a 113-game player and regular captain of our Club, with honors including 77 wickets @ 13.56 and the 2014/15 Premiership. The Chief Commissioner doesn’t have such a close connection with Moonee Valley, but was happy to don the whites, have a bat and field at first slip. Brett sent down some overs with his deceptive off-spinners, but pointed out that Tyabb – the club of Luke Batty – appeared to have stacked its team with some high-level ring-ins. And he's told us that a game or two from Chief Commissioner Ashton FOR Moonee Valley - not just in our whites - is not out of the question for next season. 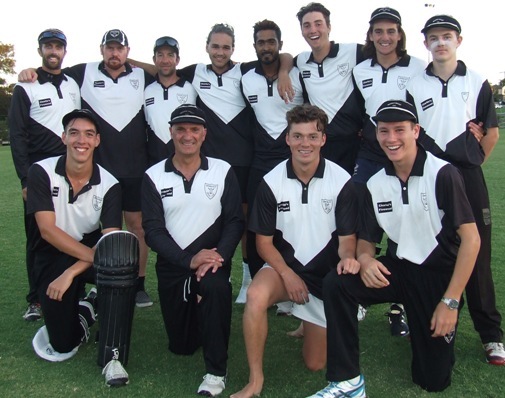 The match was for the third annual Luke Batty Memorial Shield, raising awareness of family violence and to honor the memory of Luke. 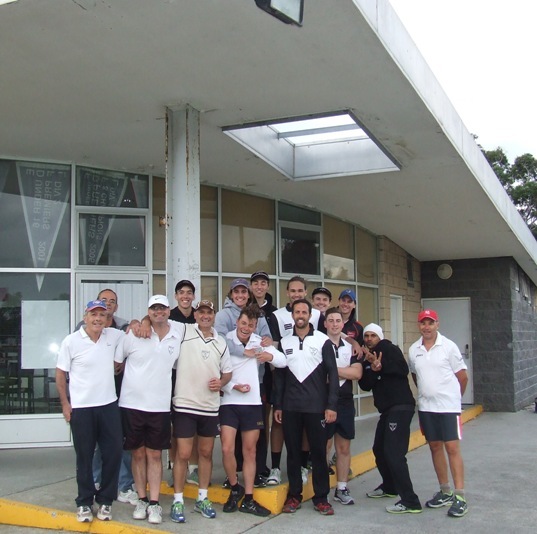 As most of you know, the Moonee Valley Cricket and Football Clubs received a $2 million grant for the Council to build new change rooms and completely refurbish the Pavilion, creating a fantastic new playing, training and social environment for our players, members and families. The new pavilion will have a significantly increased social space - almost three times the current space - a modern kitchen, bar, large dry and refrigerated food storage, an office, umpire change rooms and an upstairs cricket scoring box/timekeeper's box. We’ll also have four new separate change rooms, each with their own toilets and showers so comfortably accommodating all our teams. Above right: Any day now: Our next training session could be our last in the old clubrooms. Enjoying the atmosphere here at the start of February are L-R Graeme Bloom, Pat Taylor, Michael Cumbo, Nigel Cowan, Lou Raffaele, Anthony Cafari, Daniel Comande, Stephen Esmore, Luke Brock, Michael Ozbun, Charles Bibby, Matt Esmore, Jack Newman, Raj Aiyappan and Dean Jukic. This construction work will take place in 2018 and early 2019. The Council has provided temporary bar/canteen, change rooms, shower and toilet facilities, which arrived at Ormond Park on 1 February - as some of you may have seen. We're just waiting now for power, water and sewerage to be connected, and then we'll be moving out and over. 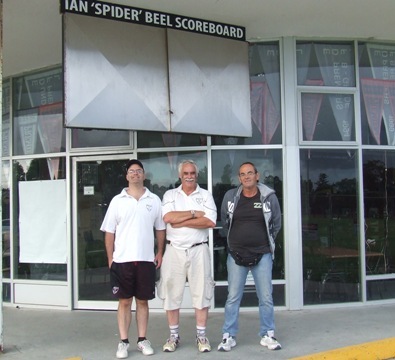 At right: The Ian "Spider" Beel scoreboard will be relocated when the pavilion goes down. Checking it out here are L-R Michael Cumbo, Charlie Walker and Pat Taylor. The temporary change rooms will be smaller than we’re used, to we expect the tail end of this season and a good part of 2018/19 will be disrupted and then we'll have our fancy new rooms! While there will be some inconvenience in relation to our temporary accommodation, we are currently exploring options for how we best use the space in a cost effective way while still enjoying our great club atmosphere. At left: Lurking around at the back of the rooms: Daniel Comande (far left) and Anthony Cafari. One of the options we have put to the Council is a structure over the portables to provide better cover for patrons and supporters, and we are working through this. Stay tuned for further updates as the construction progresses. Mark Gauci - 300 magnificent games for Moonee Valley!